The Terrace is a gorgeous and unique wedding venue set amid Melbourne’s beautiful Royal Botanical Garden. It take about 5 mins walking from Gate A at the corner of Alexandra Avenue and Anderson Street to there. With the stunning view of Ornamental Lake, City Skyline and minimalism interior decorations, The Terrace blends the traditional side and contemporary side of the Melbourne. For the wedding ceremony, you could definitely find some outdoor places in the Royal Botanical Garden. 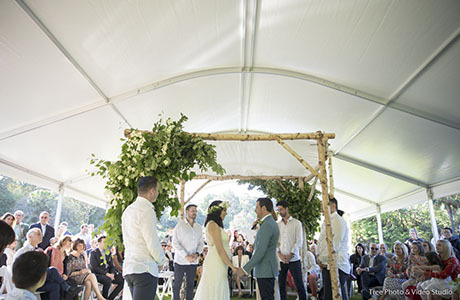 As a wedding photographer shoot Melbourne’s wedding for 7 years, my personal recommendation is to organize the Wedding Ceremony at Toxodium Lawn. The Toxodium Lawn is just 200 meter away from The Terrace. Even when you plan to spend a bit long time for portraiture after the ceremony, you wedding day could still run seamlessly. Hiring a marquee is necessary in my view. It could provide some shade in the sunny days and prevent from getting wet when the weather turn bad. Near by The Terrace, there are diverse opportunities for Wedding Photography. 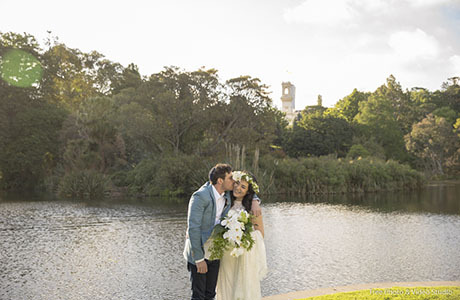 Royal Botanical Garden is always on the top of the suggestion list of wedding photographer. The Yarra River Trail with the city view backdrop, the majestic trees and perfectly manicured lawns are just a few choice for your wedding photos. With the capacity to serve up to 180 people to have a sit down affair, The Terrace offers premium food and drink to you and guests. The wedding coordinator here will help you through the whole wedding night. Making your wedding day into the most memorable day in your life is the prime goal. From a Melbourne wedding photographer’s perspective, The Terrace is one wedding reception venue for a modern and boutique wedding. Should you have any questions to plan a wedding at The Terrace , please do not hesitate to Contact Us for the suggestions and information from a wedding photographer’s view.